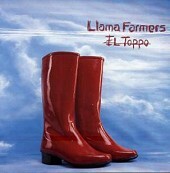 Llama Farmers' El Toppo is a solid, non-stop pop record complete with all the hooks, brawn, sweet and lush melodies, and driving guitars that can drive soft and slow or fast and loud. From the intense, quirky guitars and distant vocals on the title track to the daunting verse turned charged chorus of "Snow White," El Toppo is a memorable album from start to finish. I always enjoy bands that can knock out a good rock song and then turn around and create an ambient, quirky pop number stocked full of strumming acoustic guitars, comforting, yet eerie vocals, and a punchy rhythm section. Such is the case on "More Salt". Yet, even when you think you got the band figured out, they throw you off track by staying very similar in structure, but changing enough to make you take a second look. "Same Song" is definitely anything but. The serene, sweet pop daydream of the melody and the airy, distant work of the vocals put you in another mind space, where the music is the only thing that matters, and the only thing that can, and will, occupy your mind. El Toppo is the artistic album that, despite indulging in a lot of quirky, non-standard pop structures, still grabs you with enough pop and lush melodies that you can't let it go. I'll give it an A.